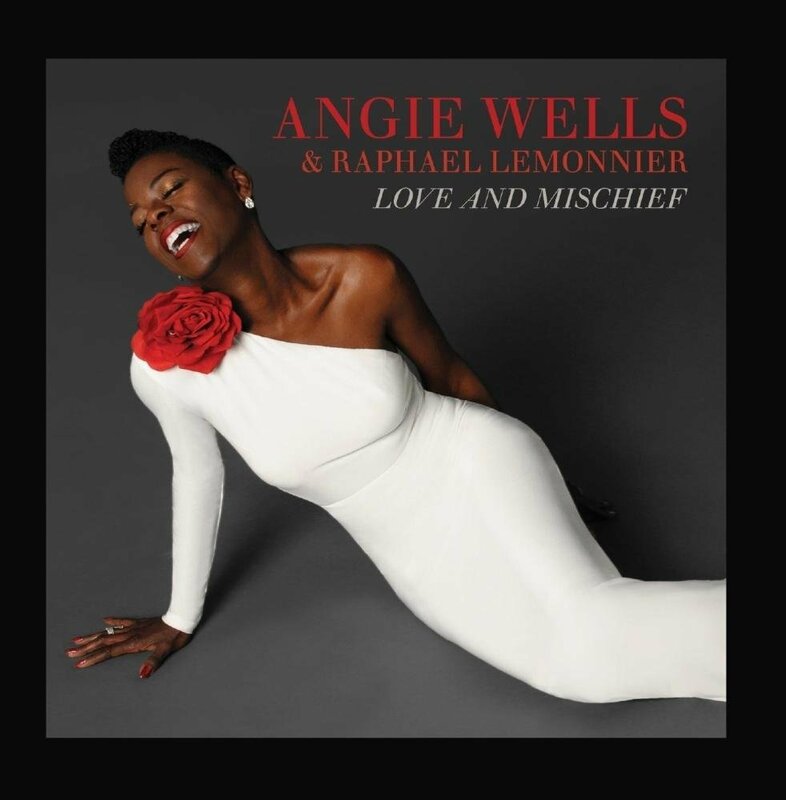 Jazz vocalist Angie Wells took some time to chat with JAZZIZ shortly after returning home from her last European tour – her longest one yet – with French pianist Raphaël Lemonnier. Wells grew up in Philadelphia in a home filled with music. Despite her lifelong love of jazz, her path to singing has not been a straight one. However, one night in Paris, she joined a trio of jazz musicians for a couple of numbers. The audience’s explosive reaction would become the catalyst, and she soon began to pursue singing jazz professionally. Today, Wells is working hard on the road, touring, and in the studio, recording. Her latest album, Love and Mischief, a collaboration with Lemonnier, was released on Valentine’s Day earlier this year. Angie, you come from Philadelphia, a very musical city! What are your earliest memories of musical influences in your home? I grew up in a household where my dad listened to blues and jazz, and my mother was a churchgoer, so she played gospel on the piano and sang in the choir. So, on Sundays, I would go to Church with her a listen to gospel; then, after Church, my dad would be spinning all his own records. My dad was a barber, so Sunday was his day off. He was no churchgoer, but his meditation was listening to blues and jazz. He had this album that, as a child, was my favorite. It was Double Barrelled Soul  by Jack McDuff and David Newman. I remember being particularly inspired by its sound. And then the vocalists…I loved Sarah Vaughan, Ella Fitzgerald, Carmen McRae… As I gold older, I got into funk and RnB, but I never really forgot my love of jazz. So, even though I had my Parliament, Funkadelik, or whoever else was hot, I would always return to my jazz roots because, you know, it spoke to me – it really spoke to my spirit. I never lost my love of the music and I guess it’s just continued on in my life – and it’s certainly not going away! So you kind of drifted away from jazz. What made you return to it? So when you got back home, you were on your way. Well, kind of. After I got home, I had a big wish – my husband and I had been working on this for many years. I got pregnant. And it was ecstatic. When my son was about six months old, I went into a studio and recorded a demo with three legendary musicians: Joe LaBarbera on drums, Tom Warrington on bass, Bill Cunliffe on piano. I started sending the demo out and started getting responses. But why had you not pursued a singing career earlier in your life? I just remember watching shows like American Idol with people who sounded terrible but thought they sounded great. I wondered if I had the same kind of delusion about the way I sounded. I didn’t want to be one of those people who think they sound great in their head but really don’t. So, that’s what was happening in my head. In other words, you were your own biggest critic. I still am! I’m so hard on myself. But I also think that’s what makes you have this quest to be better and constantly keep learning because, if you get satisfied with yourself, you just kind of lay back and put your feet up. I try to use my insecurity productively. In Love and Mischief, you do a lot of covers. Is this constructive criticism part of your process when you revisit these classics? Yes. I always want to bring something that has a different flavor to these songs, but the critic in me keeps me having some sense of reverence and respect for the music so that I don’t, you know, destroy it! Let’s talk about the tracklist of Love and Mischief. How did you choose the songs? That’s a duet with Bili Redd [Grammy award winning Gospel vocalist]. How did you meet him? He kind of mentored me when I started showing up at jam sessions and tried to meet as many musicians as I could. I always loved his voice – he’s got one of those manly voices! I’ll never forget, one morning, I was feeling bummed, and he rang me out of the blue at nine thirty in the morning saying: “I’m just calling you because during my meditation it kind of came to me that I had to tell you that you have to commit to your singing career.” We had a long chat and it was very encouraging. That phone call never left me. I’ve been very fortunate to meet people who would share knowledge with me and who have been very supportive. Like China Moses, Dee Dee Bridgewater’s daughter. She and I met in France about eight years ago. She had just come out with her album, This One’s for Dinah . And we exchanged information and kept in touch. She started connecting me with people there, including Raphaël Lemonnier, who I did Love and Mischief with. Raphaël and I connected right away, and he said: “I like your voice. Would you like to do a couple of jazz festivals with me.” And I said, “of course!” And that’s kind of how that got started. We just finished our third tour together – this was the longest one yet. How would you describe your collaboration with Lemonnier? That’s exactly what it is: it’s a real collaboration. Raphaël is very respectful of singers and what they need. But he is also a musical director who gives you ideas and then you come up with things together. There are two originals on Love and Mischief. One, “The Moon is Swinging on a Line,” Raphaël had written the music for, and Mathis Haug, who plays guitar on the song, had some trouble writing lyrics for it because of the language barrier. So, Mathis and I sat down to write them together. The melody was so beautiful, and we recorded it a few weeks after we finished writing the lyrics. The other, “She Ain’t That Kind of Girl,” I wrote after watching Breakfast at Tiffany’s [1961 Blake Edwards film]. The scene when Audrey Hepburn walks down the street with her little coffee and croissant, and it dawns on you that she’s been out all night – there was something about it that spoke to me. The first night I arrived in France to go on my second tour with Raphaël, I had jet lag from flying in the middle of the night, I sat down with him and told him about the song, and that I wanted to write it on paper. And he said: “I like this, maybe we can do something unusual, and add a little bridge to it…” so we kind of created a little melody for a bridge and I wrote words to fit into that. And so it was a collaboration. He’s good to work with. It’s a real symbiotic type of a relationship. I’ll be going back to Europe next year to play at a few festivals. But I actually have two careers. My second career is that I run the makeup department on a hit television show [Blackish]. I work part-time doing that, and the rest of the time I sing. I have two Emmy nominations: one as part of the team on the show Mad Men, and the other for running the makeup department and designing all the makeup for a television film called Gifted Hands, which was about Ben Carson. Now, I’m going to tell you off the cuff…I don’t agree with his politics! That’s interesting! Two careers, both of which you are very successful at! Well, thank you! One of the things I’ve been trying to do is what Bili did to me: every morning for the past while, I have been trying to put a positive message on my Facebook page for people. I write things that come to me during my morning meditation. I’m trying to become an inspiration. I didn’t start singing jazz when I was 15; I was a grown woman. So, I’m trying to spread the joy and encouragement to other people so that they can pursue their goals and their dreams. I’m trying to tell other people not to place limitations on yourself because if you do you will stop yourself from accomplishing whatever you want to accomplish.